is paris always a good idea? : Home for the Holidays. It's officially that time of year again! The holiday season is certainly abuzz! With that, free time just doesn't seem to exist! Oh là là, you guys. Are you feeling it too? Between holiday soirées, travel planing, for those of us staying put; Christmas feast planing, shopping, fighting a reoccurring cold, guzzling champagne (or in my case, sparkling white) and getting in all of that end of the year work in, to say there is a lot going on would be an understatement. To put it into perspective, we're hitting mid-December and despite my many attempts I still haven't watched Love Actually (let's be real, the only reason Mariah has become acceptable). But seriously, what kind of Christmas cornball am I? Is this some sort of joke? Love Actually is normally ready to go the second Thanksgiving ends as this is what kicks off the holiday season. Am I wrong here? This year, poor Hugh is still waiting to jump for my love, and Laura Linney is waiting for me to beg her to not answer the phone when she's about to get some good post-Christmas party lovins (the best kind if you ask me). 2008...ah, good times. I'm still allowed to think about that stuff now and then, just for fun...right? Right? And the silences takes over...the cheese stands alone. Not wanting the holiday to slip away as they had the past few transient years of my French life, I wanted to honor some of my favorite traditions that makes Christmas so special. Here are some snapshots from my holiday spirit. Ladies and Gentlemen, my first ever French Christmas tree that I couldn't resist cheesing up with mini Eiffel Towers that I picked up at the....wait for it....Eiffel Tower. No tree is complete without a few goodies underneath it. Aurelien's grandmother stopped by with espresso chocolates from Printemps that I am insisting are Christmas presents. The wrapping and Dior sticker are so pretty and French that I want to enjoy its beauty all month. Despite me not exactly agreeing with my family this year, there's no denying that I'm an Italian girl. 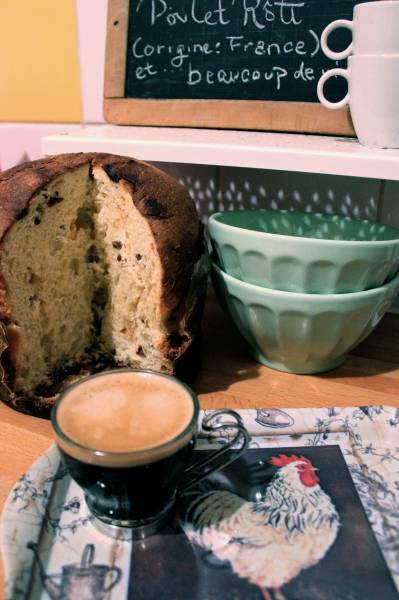 Growing up, Christmas meant having Panettone and Nuona's thick Italian hot chocolate every morning for breakfast for the entire month of December. As an adult who fiends off of caffeine, I sub out the hot cocoa for thick espresso but the Panettone stays. To me, this is what Christmas tastes like. Christmas is in full swing chez nous with our milk chocolate candles burning, copious amounts of food and goodies bursting out of the fridge, a stocked wine rack and a cheesy American holiday classics played every now and then (read: every day). It feels good to celebrate my first Christmas in my new home...as I am now home for the holidays. What makes Christmas official for you? Is it decorating? Eating a lot? Or just getting drunk? Oh man, I go bananas for all the Christmas crap... watching "Home Alone" or the PBS Andy Williams Christmas Special, wrapping gifts (which I've still never mastered), drinking mulled wine or spicy hot chocolate, listening to everything from the Mariah Carey Christmas album to Tony Bennett, the smell of Christmas trees... heaven! I'm glad to see you're keeping some of your childhood traditions alive while making some new ones in France! Bisous! 'Home Alone' is next on the agenda. Love that movie, the casting is just great. Joe Pesci! I love when they shove us ginzo Italians in the midwest. I have to fess up to watching the Christmas 24 channel far too much, although I'm not so into the decorating, as most of my 'free time' in December is taken up making presents! I have to watch Home Alone 1 & 2, A Christmas Story, Love Actually and The Polar Express. We've had decorations up since the day after Thanksgiving. This year we're giving Christmas all we got! Last year around this time, I didn't care at all. Oh, and eggnog! Eggnog!! YES! My mom is coming and I'll have to get her to bring a carton over. Yes, I know, I can make it but I really don't want to know what exactly is in eggnog! It's probably a day's worth of calories! I'm glad your living it up and enjoying the season! I know what you mean by not caring. That was me last year as well. My apt had been robbed, I knew I was moving, so I didn't have any attachment to the place to gussy it up with holiday cheer. Those days are over! Phew! I meant the cheese stands alone in regard to post-Xmas party hook ups with your work crush. ; ) Love Actually is now a classic, I knew I wouldn't be alone on that one! That and 'The Devil Wears Prada' are the two chick flicks that guys actually don't mind watching! Congrats on getting all of your presents done! WOW! I haven't started! Luckily this year, we're doing a secret Santa with Seb's fam, so the pressure is off. Potatoe latkahs!!!! Getting some today at the Marché bio and making my own apple sauce. Also love Christmas dinner with our chapon melon and everyone stuffing themselves with foie gras like fat geese. We have a log o' fois gras in the fridge that I pick at as if I'm Marie Antoinette. I'm frugal with a lot of things but I need an indulgence like this for the holidays! I'm glad I'm not the only American who loves the foie gras! Well normally I am a bah-humbug person, I try to ignore Christmas. Christmas just meant, lots of extra work, irritating music in crowded shops, tacky lights and feeling guilty because I haven't got time to join in. You have inspired me to get my minimalist Christmas tree down from the loft today and decorate the house. Something I do not usually do till 20th December at least, if at all. I'm glad that I inspired you to decorate a bit! Why not? It's Christmas!! Happy Ho Ho Ho to you! "Love Actually" is also one of my all-time favorites but not a Christmas tradition; haven't watched that movie in ages and I own it too, maybe it's time...I need to get in the mood. I stopped buying a Xmas tree two years after my daughter left for college in NYC and just decorate the house with some candles and 'christmassy' stuff a couple of days before she comes home for the holidays. We usually gather at one of my sisters' houses and they do put up a tree and everything else so we get enough of that there. 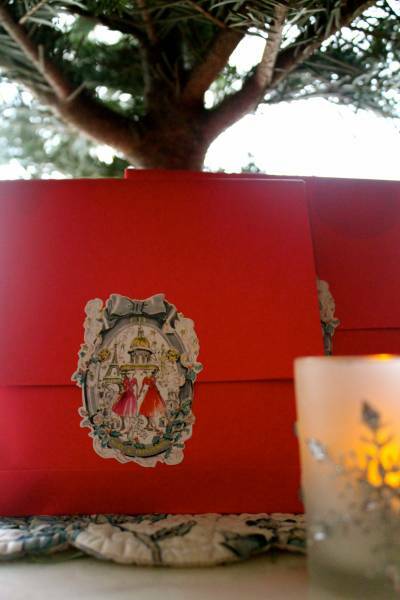 Our tradition is to have a HUGE dinner on the evening of the 24th where after stuffing ourselves we open the presents. This is a ceremony that takes forever but it's lots of fun; we dance and sing and drink lots of champagne. Then the next day we have another HUGE late lunch (no leftovers, we cook again) and drink and sing and dance some more. When my parents were alive their house was Christmas central and it was pretty much the same: lots of delicious food, lots of presents, and lots of singing and dancing while my father played the piano. After that we have a week to recover and start all over again on the 31st and 1st. (minus the presents), we repeat the two days of eating and drinking etc. but with different menus, we cook a lot for the holidays! These are a wonderful few days to reunite with my daughter and sisters that don't live here and just enjoy being all together in one place, and their arrival is what I would say really makes Christmas official to me. Singing, dancing, eating and champagne!? That sounds like HEAVEN to me!!! Can I come? In our family we had all of that but the singing and dancing was replaced with fighting and snide comments. Friggin' Italians, I tell you. They're out of control. Perhaps this year now that I'm on my own, we'll take on some of your joyous traditions! The tree looks cute. Are those blue lights? We just watched Love Actually last night! My boyfriend had *gasp* never seen it, so we downloaded it and curled up on the couch to watch. Unfortunately, there were no subtitles, so my favorite storyline between Colin Firth and the Portuguese girl fell flat, but my bf enjoyed it. And I love your cute tree! I guess it's finally Christmas time for me when I start to see the decorations everywhere. Though I find it unacceptable if said decorations are up before Thanksgiving. So I guess it's the fact that it's December and there are decorations. Oh, and Christmas films. It's officially the holiday season when you want to sit down and watch a Christmas fave. How come you didn't have subtitles? Did you download it? We finally watched it this weekend, and I insisted on the French subtitles otherwise a lot of the jokes would get lost. Good for your boyfriend to keep up! My one teeny tiny complaint about the film is how they reference Natalie as being heavy! It's so random and unnecessary. Do you agree? I actually think that actress was way cuter than Keira Knightly. We downloaded it. It never occurred to me that there wouldn't even be subtitles for the non-English parts! And as we were watching it on the TV, even if there was a subtitle track, we couldn't activate it. My boyfriend watches everything in VO without subtitles so he has really good comprehension. It helps when I get frustrated and need to rant about something in English! I think the actress who plays Natalie is so cute. She looks normal if you ask me. Though I guess by Hollywood standards she is "chubby", and that's just a shame, because most girls have a body shape closer to hers as opposed to Keira Knightly. Oysters! Lutefisk (lye fish) and lefse! And rosettes! The problem with having Norwegian ancestors is that no one, except other people of Norwegian descent, understand why we get all excited about fish for Christmas. The only holiday food from my childhood that we can duplicate in Paris is Oyster Stew, so that's what we'll have on Christmas Eve. Savor and enjoy all the Christmas preparations with Seb in your first Parisian home! Opening the box of ornaments from Stephane's and my first Christmas together always brings back a flood of good memories - it was hard being away from my family but it's also when we started our own traditions. You guys aren't alone, the Italians go nuts for fish on Christmas Eve. Actually, I think they do here in France as well. I remember having a fish feast at MF's family's house a few years ago. Your fish selections sound more exotic than ours..lutefish and lefse! It sounds delicious. There's nothing like a Christmas tree to warm a place up, eh? The scent of our pine is really subtle. Is yours too? This is my first French tree so I wasn't sure what to expect. For starters, the tree stump and the fact that I don't have to water it was a surprise. 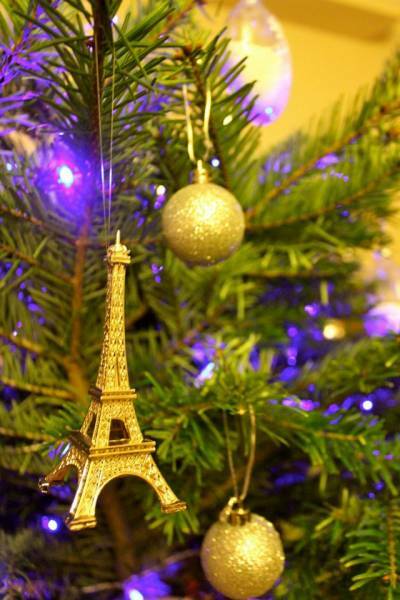 Your tree is pretty French with the Joyeux Noel ornament! I love it!! A Christmas Tradition I Hate. Like a Kid on Christmas. Pute, Pute, Pute! Joyeux Noël!